A few years ago a personal training client came in to report that his doctor told him to “cut the cheese”. Of course, I didn’t quite know how to respond to that until we figured out that his doctor actually said he should “cut back on the cheese”. It’s amazing what can get lost in translation. My client’s first language is French. In addition to providing us with a laugh, his doctor gave him a great piece of advice. He said “Cheese should be eaten as champagne is drank.” That is brilliant advice. We are consuming far too much cheese these days. An ounce of cheddar cheese contains approximately 115 calories. What does an ounce look like? It’s about the size of 4 dice, or one 9-volt battery. A medium sized banana has 105 calories. In addition to the difference in the volume of food, the nutritional make-up between the two is vastly different. 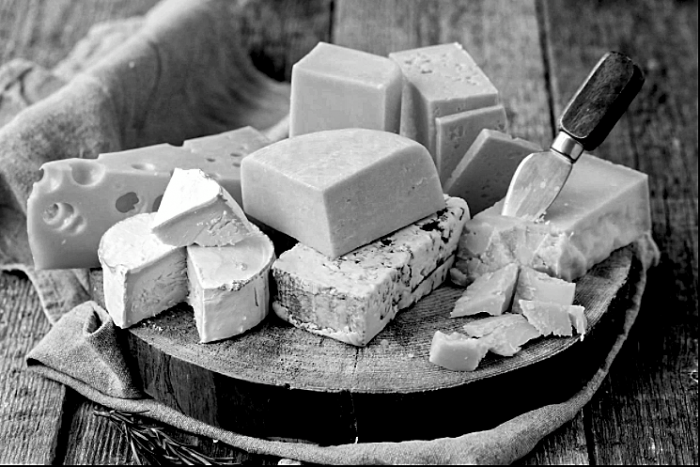 The killer for the typical piece of cheese is the fat content. And all we need to know is that it is the bad fat we’re talking about. I can’t remember exactly when the cheese craze started but there was an evolution that led to it being everywhere, and in huge quantities. Try to think of the last time you went to a restaurant and attempted to order something without cheese. Or even with just one type of high quality cheese as an ingredient. It is available, but so is pizza with a crust stuffed with cheese. Right about now you may be craving melted cheese on something, and that has nothing to do with being hungry. And that is exactly what the food industry is banking on. We’re addicted to the stuff! That is both sad and true. Where do we go from here? How about we set up a challenge that for the next week we limit our cheese consumption to one 9-volt battery a day? Sure things may not taste as good initially but you will eat them anyway. And the amazing thing is, you’ll be healthier for it. Does Dancing Count as Cardio?